If you've been feeling like that the last few days you've come to the right place. 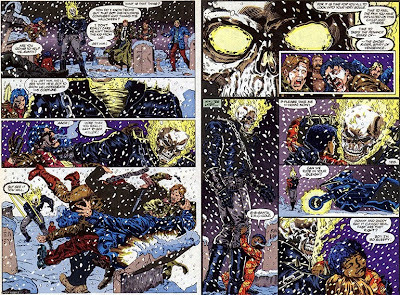 For this edition of Moments In Cool, I'm focussing on Howard Mackie, John Hebert, and Al Milgrom's fantastic efforts on a heart warming tale, starring that demon of hellfire; Ghost Rider. 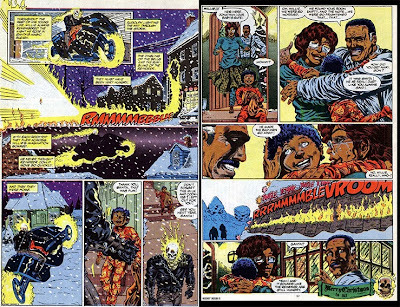 Where many writers tasked with turning the Spirit of Vengeance into a holiday romp for the Marvel Holiday Special 1991 would run a mile, Howard dives in, adding a blind boy in trouble and one awesome twist of mistaken identity. Remember to click to enlarge and enjoy folks! 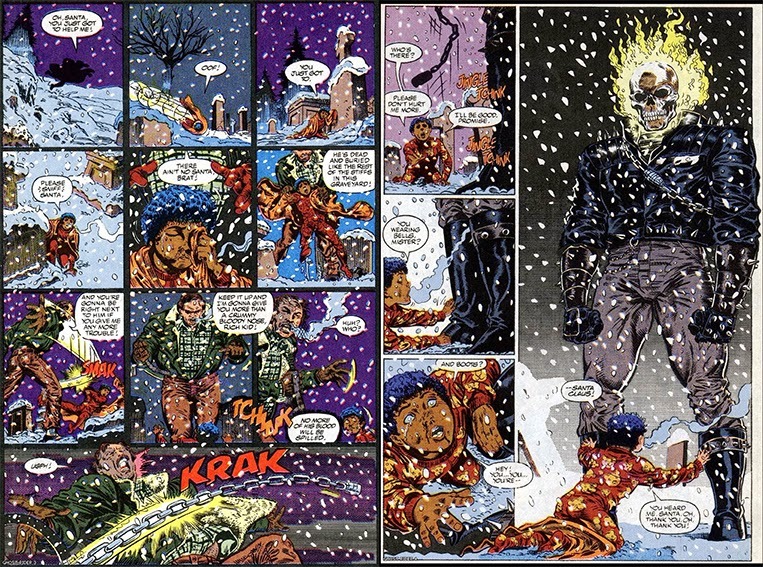 I'm never looking at Ghost Rider the same now that comparison has been made. Still, I dig how the panel backgrounds change to white as the Rider enters the story. Nice touch - on with the story! 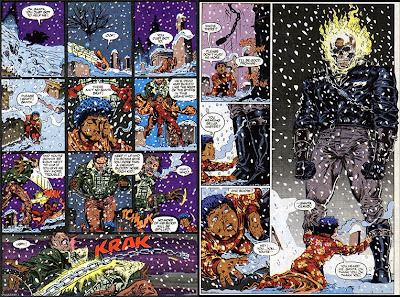 Yep, that was the Dan Ketch/Noble Kale/Whoever-he-really- was ghost rider and a large part of why this one was my favorite, even though I was a ghost rider fan well before this one came on the scene. I wish Marvel would bring him back, though I would suggest Marvel never show his face and more importantly give no official name. Without that, he could be anyone, which would be a much safer route for a story inspired by very old writings still important to many living cultures. Remember the issues raised when the cast had been announced for Thor? And that religion based character hasn't been part of a living culture since goodness knows when. In fact mistaken identity was kind of an ongoing theme with this one. One might say we have the old plot device of a masked character in place here hiding in plain sight, but the usual rules for that mystery in a character don't have to apply cause there's no mask if there's no face. Hey Cowlamity, thanks for stopping by and commenting. Happy holidays to you and yours! Yeah I have often thought if The Rider would be better as a wondering spirit engulfing various hosts who will see innocent blood shed, yet still beset by same demons for consistency. It would have the hallmarks of those great 80's tv shows like stairway to heaven etc. Still 2014 promises two riders in the Marvel U so who knows what we'll have seen by this time next year.